The Mademoiselle doll from Moulin Roty’s charming ‘Mademoiselle and Ribambelle’ range is so very sweet. 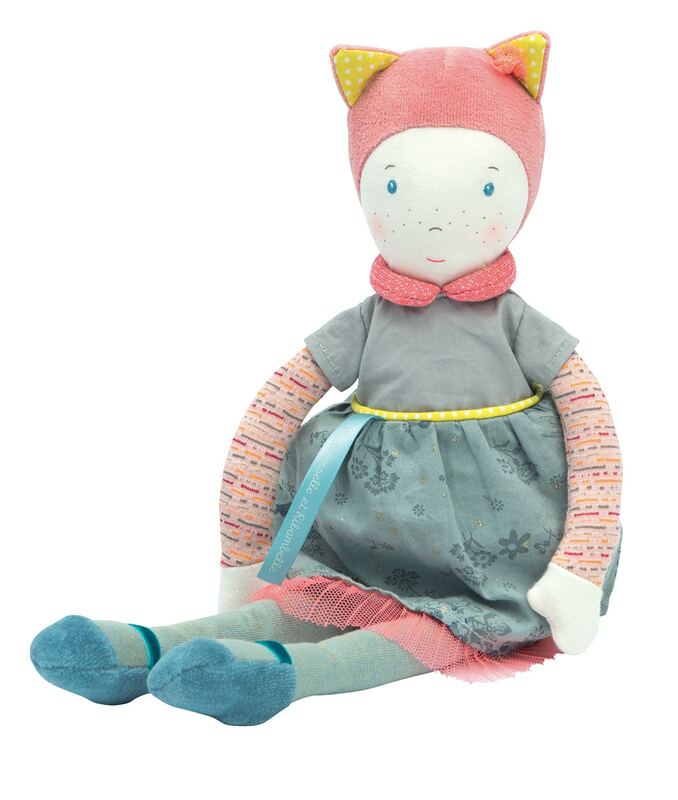 Along with her distinctive cat ear bonnet, she is wearing a sequinned, flowery cotton dress with a tulle frill and pink collar (her dress is removable) and her outfit is completed with velour and velvet ballerina shoes. 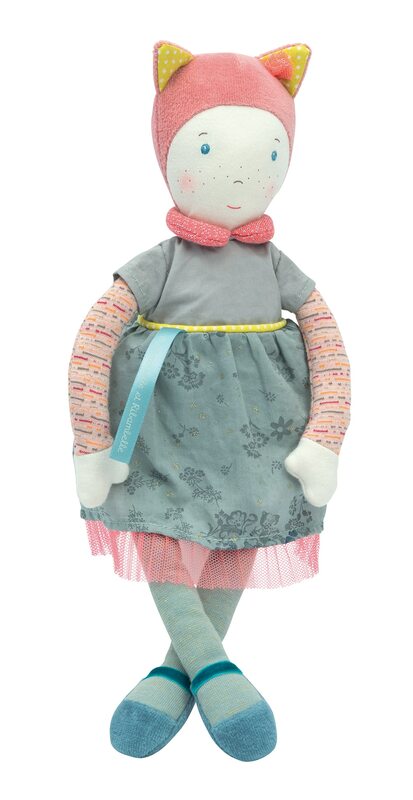 The Mademoiselle doll features a wide range of fabrics (cotton, jersey, tulle, velour and velvet) and she is beautifully detailed. 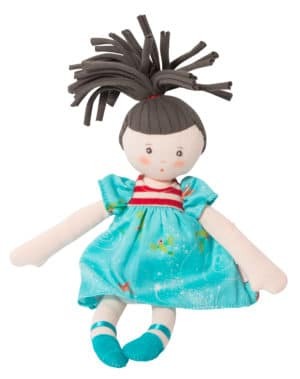 Her face and hands are made from off-white knitted jersey, and her body is a mix of coloured, sequinned and blue/green jersey. 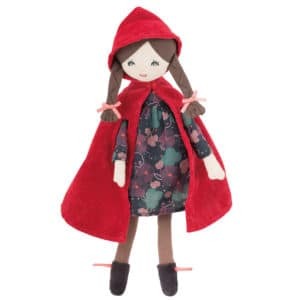 Features on her cute face are embroidered and painted. Moulin Roty’s ‘Mademoiselle and Ribambelle’ range was released in late 2014. 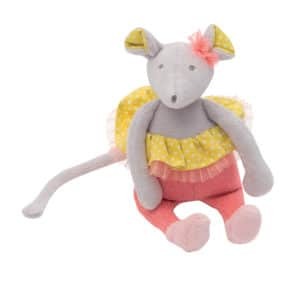 It is a soft, delicate collection featuring 5 characters – the Mademoiselle doll, Monsieur Rabbit, Mademoiselle Mouse, Monsieur otter and Madame owl and themed around the coming of spring, music& dance and the enchanted forest. 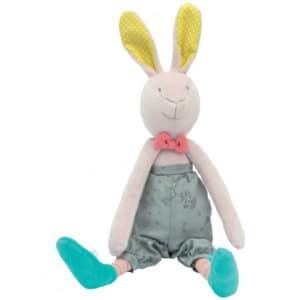 Soft toys are beneficial to little ones because they provide a form of comfort, allowing the child to self settle. They can also be used as part of the role play games that help make sense of the world. Size: Approx 38 cm high. 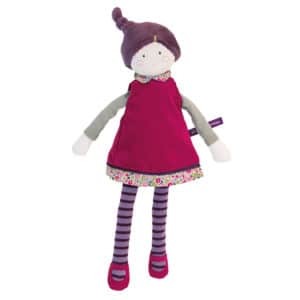 Designed in France by Moulin Roty and made from fabrics sourced in Europe. Care Instructions: Machine wash on a delicate cycle. 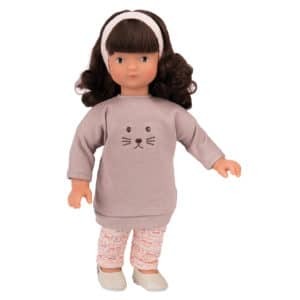 Love love love this doll and it’s my baby’s clear fav my a long way…and believe me she has a few!! Haha She just loves to carry/drag it by the legs everywhere she goes! Such a fab design…keep them coming!